This was the first thing I read when I woke up this morning (as I treated a nagging low BG). I have read it a few times throughout the day, and have read it 3 more times as I’m getting ready for bed tonight. I hope to absorb this message, let it really sink in. Let it soak through and weigh heavy in my heart. I’d like to live more like this. It’s a quote too good to keep to myself. You are already naked. How beautiful. This Happened Today (and some news from yesterday). Wow! We did it! We raised an astounding $40,714.55 and we still have donations and sweepstakes ticket sales rolling in. We have achieved a fundraising level far beyond my greatest hopes. Thank you! We had Walkers this year from NY, NJ, PA, IL, VA and MN. We had our largest Walk team ever. We had friends and family from the very first Alecia’s Stem Cells team in 2001 and first time walkers who’d never been across the Brooklyn Bridge. We had a grandmother who’s T1D, a 40-something T1D (me), a 20-something T1D and a 8-year old T1D. The team may carry my name, but we were walking for ALL of us. 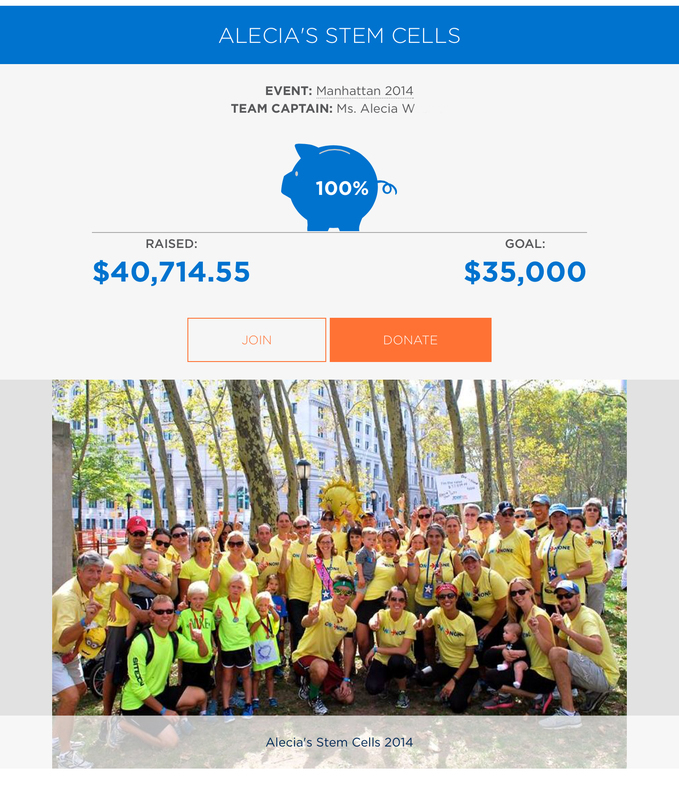 Alecia’s Stem Cells was announced as one of the top 5 fundraising teams for JDRF NYC. We ran out of yellow ASC team ONE to NONE shirts and even had some walkers in the grey shirts from our online fundraising sale last month. Simply put, it was AMAZING adventure this year. At our post Walk lunch, I finally got to announce what I’d been waiting 2 months to say, this year I was saying good-bye to Alecia’s Stem Cells. Sunday 9/28 was the end of a HUGE part of my life with JDRF and the Walk program. 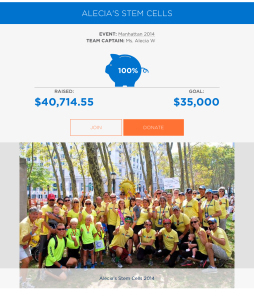 This team has walked 15 JDRF walks; 13 in NYC, 1 in Boston and 1 in LA. Sunday wasn’t just an end though, it was a step for me in the next level of my involvement with JDRF, and a new adventure. I am now joining JDRF’s endurance sports program, specifically I am looking to participate in 2015’s “The Ride” which is a 100 mile bike ride held in various spots across the United States (including Death Valley which sounds like a place I’d like to avoid). I am excited and scared silly to train for something like this, not just as a T1D navigating low and high blood sugars in an endurance sport, but as someone training on a bike via Manhattan streets (yikes… well for now). My next “step” is less about stepping and more about pedaling. To the Walkers, the fundraisers, the donors, and everyone who sold/bought our online shirts and Mercedes raffle tickets, I thank you. Whether you walked or cheered us on, you are indeed part of the ASC team. Thank you to everyone who supported my fellow walkers too. We had many walkers who reached V1P status by raising over $1000 for our team. Thank you for supporting my dream, a dream shared by so many others involved with JDRF, that there IS a future where T1D simply doesn’t exist. As all this Walk stuff has been going on, I have been involved in another project that has been a rollercoaster (since June 2013). On Friday, I had my final screening at Mt. Sinai for the next step as a hopeful participant in an artificial pancreas clinical trial. As I have mentioned, this is just ONE program that is happening because of a grant from JDRF. The Artificial Pancreas is not a CURE, but it is an incredible advancement in diabetes care and management. The Artificial Pancreas Project is JDRF money at work. This is happening because of YOU. Yesterday I got my results. I am no longer a candidate. I have PARTICIPANT status. Thank you for helping JDRF turn Type One into Type None. Now, I need to get a bike (don’t worry, I do have a helmet).